I bought a couple of hula skirts at the Dollar Store last year thinking I might be able to make them into a Fall Wreath. The raffia-like hula material just reminded me of Fall for some reason. Maybe it looks like straw or hay? I never got around to making the wreath last year, but I found it last week as I was cleaning out my craft room and thought I might try the idea finally. I really like the way it turned out. And I used some metallic paint pens on the pumpkins which I think brought it a more modern look. 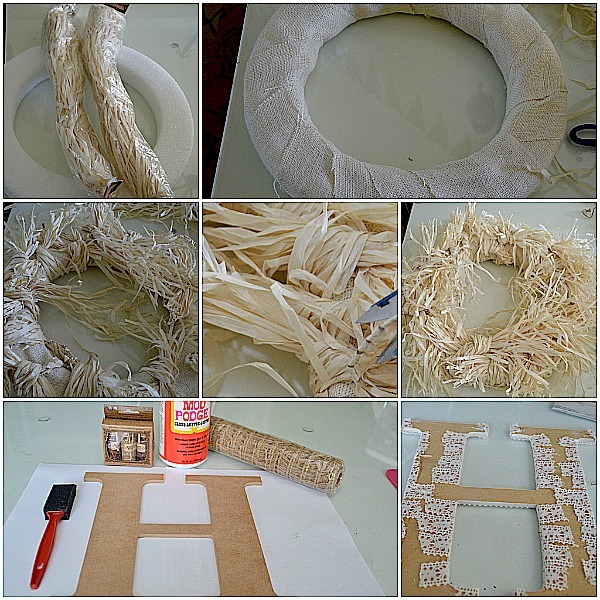 Here’s how I made the wreath. It was a 30 minute project. I cut the burlap material into sections of 4-inch wide sections. I cut each hula skirt into 6 sections. And then I tied the sections onto the wreath form, tying the knot at different places on the form, so it wasn’t super even. Once the hula sections were tied on, I fluffed the sections around the wreath so each part was evenly covered. Then I took a 6 foot pumpkin garland I bought a few years ago, and wrapped it around the wreath form. I fluffed the hula sections over the garland. I also added some chevron embellishments on the pumpkins with paint pens. So easy. Then I painted the monogram letter and then I cut sections of ribbon to wrap around the letter. I cut each section separately, instead of wrapping it around the letter, which would have made the stripes diagonal instead of straight. I hot glued the ribbon on the letter and then hot glued the letter onto the center of the wreath. Finally, if there are scraggly sections of the hula skirt on the wreath once you get it hung, just cut those sections to make it look good. **Another idea for embellishing the letter would be to add mod podge to the letter and glitter it instead of adding lace. I did this with another letter and put it at the front of my porch. I love the way it catches the light! 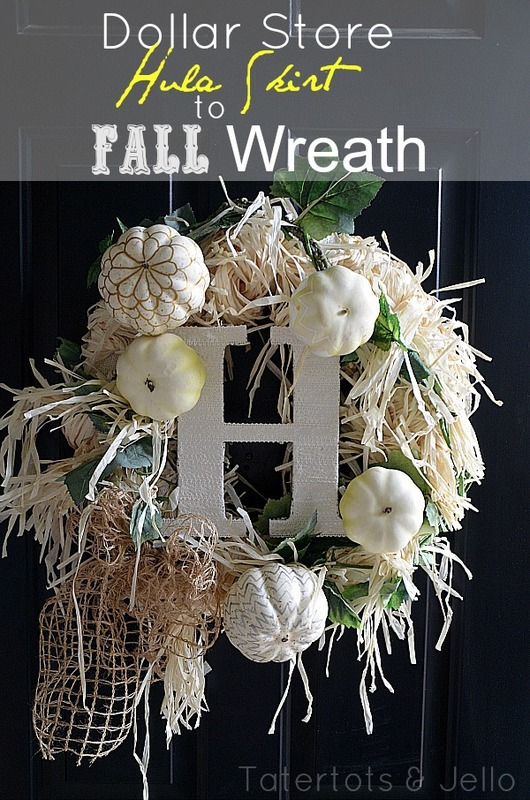 And that is a simple and inexpensive Fall wreath idea. 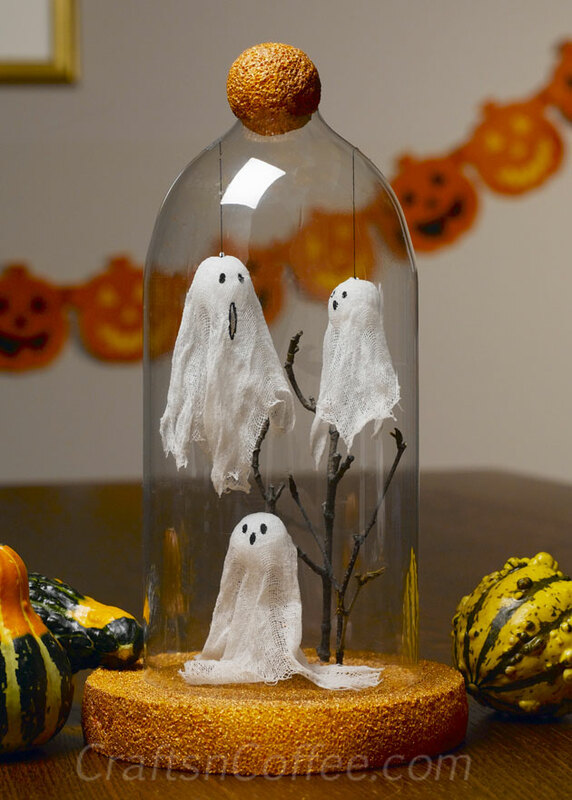 I love finding Dollar Store items and remaking them into something else!! 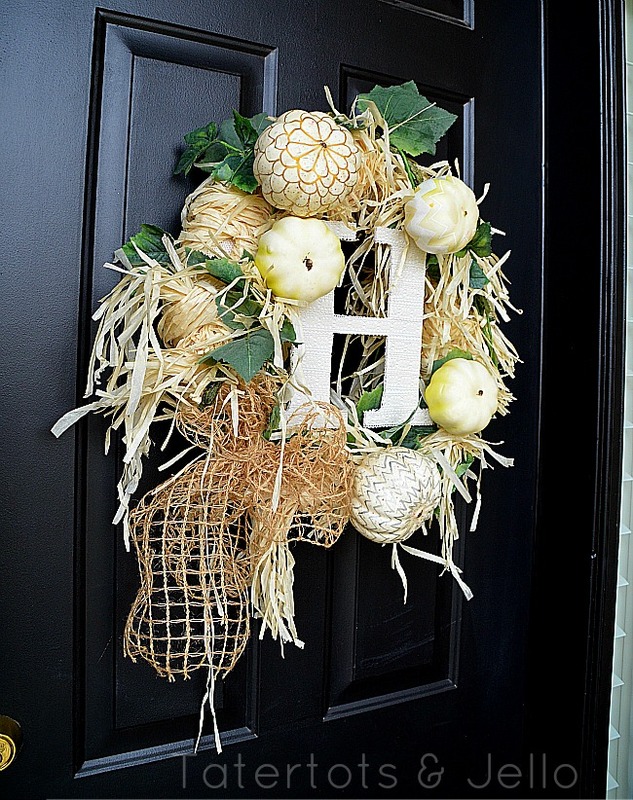 It’s been so fun thinking of a new wreath each month for the Styrofoam Challenge. 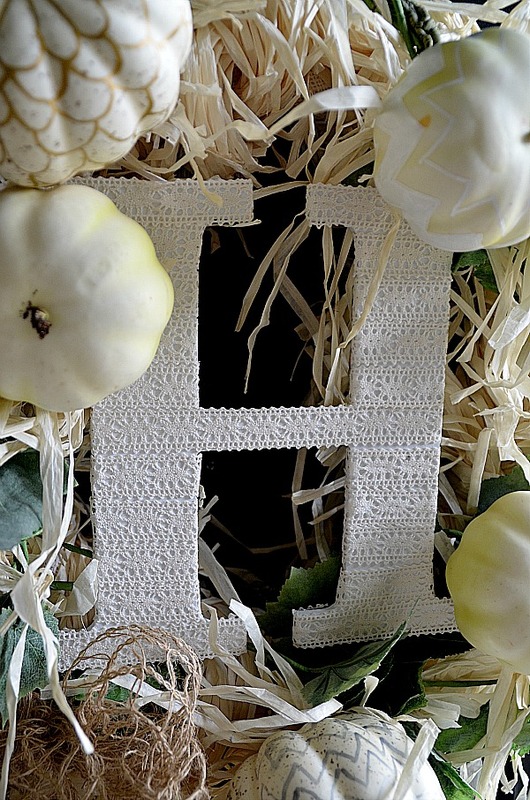 We also have a fun Pinterest board where we love to pin beautiful wreaths – The Ultimate Wreath Board (Styrofoam)! 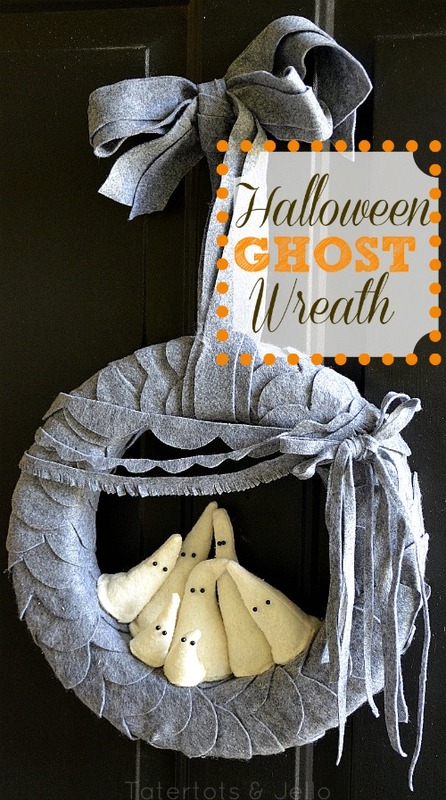 If you have a styrofoam wreath that you would like added to the board, leave me a link in the comments. Make a Plaid Pumpkin Ruffle Wreath!! 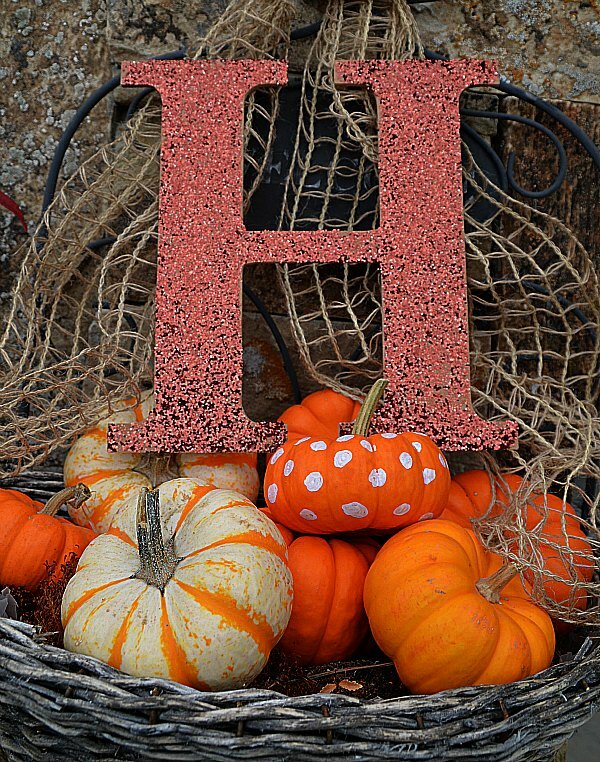 Make a Fall Houndstooth Plaid Pumpkin Wreath! Bright and Colorful Mantel and Decor Ideas for Fall! Gorgeous & clever! Thanks for sharing! that’s a great idea and I love the end result! Thanks so much Shannon!! Love you!! Thanks Debbie!! That means so much to me. Thanks for the comment!! JEN! get outta here! this is so creative! 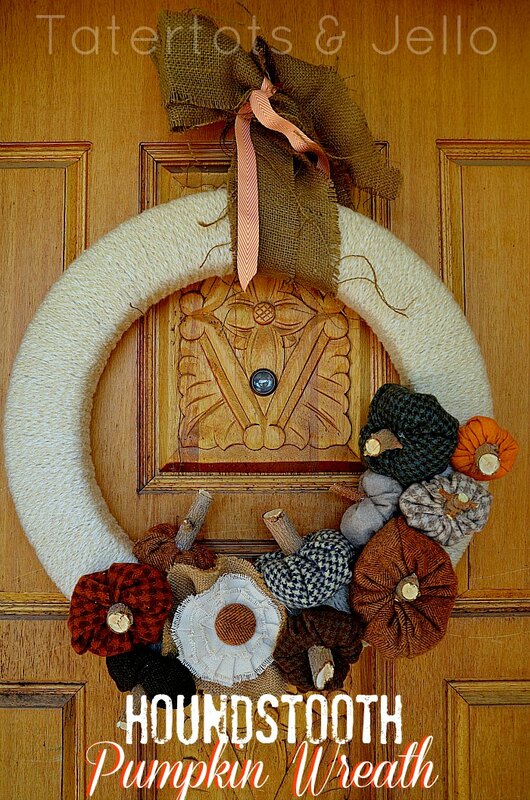 all the natural elements in this wreath make it feel so fall & thanksgiving-ish! Love this idea. You are the wreath queen! I think we need to mail you a bunch of random stuff and see what kind of wreath you can make. ha! I would have never known this was a hula skirt. Fun! You are genius! Love the hula skirt wreath…it is so pretty! Thanks for sharing and inspiring. You are one crafty lady! 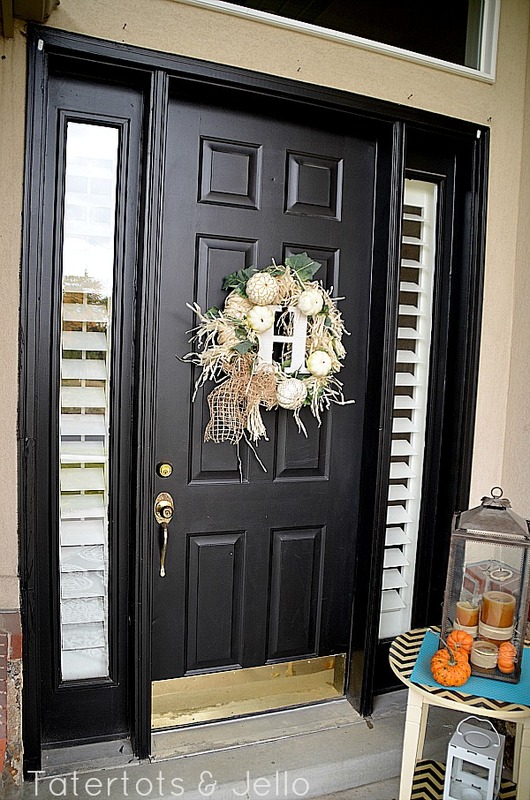 Who else would think to use a hula skirt for a wreath…very cool! LOL – thanks Jessica!! Thanks for the comment my friend. I made two different monsters out of wreath forms and stands here! 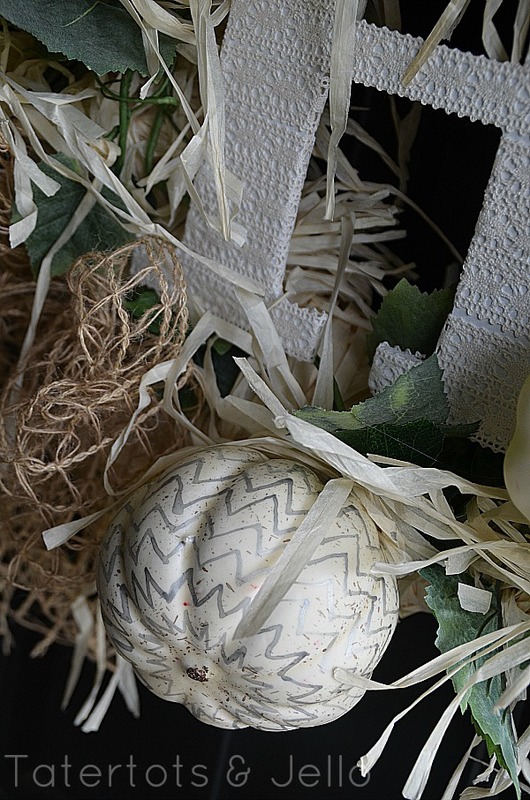 All your wreaths are stunning! The hula skirt one is my favorite, just beautiful. You are so talented! So creative, Jen! Who woulda thunk to use those hula skirts for fall decor – not me! hahah! Thanks Michelle. For some reason those hula skirts were screaming fall to me. So funny. Well, I need to head over to The Dollar Tree! 😉 There’s one close to our house, but I haven’t been in awhile. LOVE how you painted those pumpkins, Jen! Thanks Amanda!! 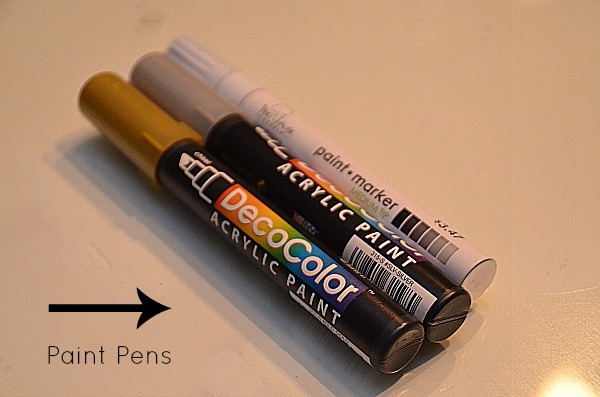 I am LOVING those paint pens. 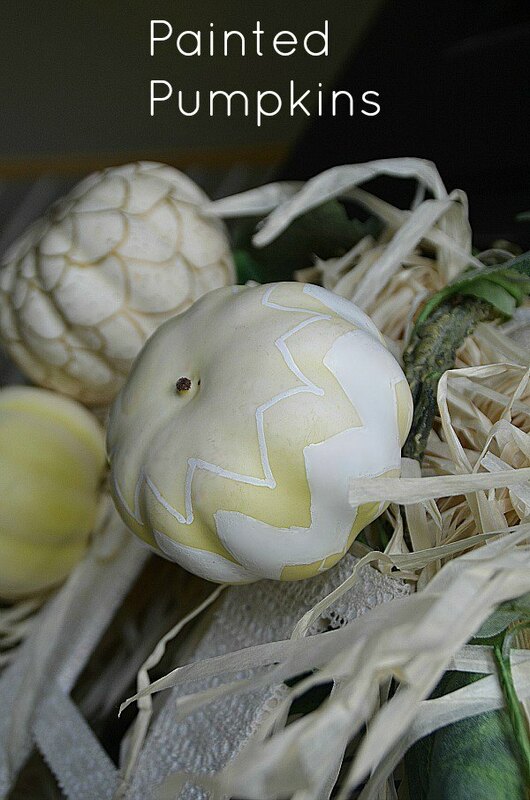 Makes me want to paint every single pumpkin in sight. I am excited to try them out on some Christmas projects too!! Thanks for the comment my friend!! Thanks Linda!!! It’s so fun to wander around trying to come up with things to transform in there. I’m glad I’m not the only one that loves doing that. I love all of your projects – you are super creative! !